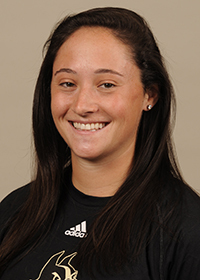 Kate is in her 2nd season on the coaching staff at Villanova, specializing in helping the goalkeepers and defense. Previously, she was a graduate assistant at Georgetown, receiving her Master’s Degree in sporting management. She was a part of the coaching staff that helped the Hoyas to their 2015 BIG EAST regular season Co-Championship with a 6-1 conference record. She is also a former goalkeeper of the Israeli National Team and a current assistant coach for the Israeli National Team. As the defensive coordinator for the 2017 World Cup team, she helped Israel to a sixth place finish in the World, where they knocked Wales out of the top five for the first time ever. She was a four-year letterwinner at McDaniel College, starting three years in net. Goldstein graduated in May 2014 with a bachelor’s degree in business administration and management as well as a minor in sports administration.